Always use sweep 90° elbows instead of the more readily available standard 90° elbows wherever possible. 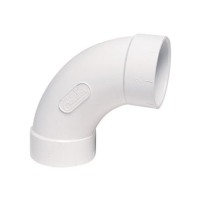 A standard 90° elbow adds the equivalent friction loss of about 6’ feet of straight pipe. A sweep 90° lowers that friction loss by 50%. On an average pool, pump sizing calculations can be based on about 200’ less of pipe than a pool using the standard, restrictive elbows. Your pump will not have to work as hard, which equates to longer life and lower cost.